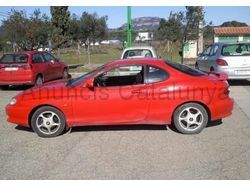 ÉS EL MODEL 2.0 FX 16V 138CV,ÉS DE L'ANY 1999 I TE 119000KM. L'EMBRAGAMENT ÉS NOU RECIEN CANVIAT, TE RÀDIO CD AMB CARREGADOR DE 10 CD´S INCORPORAT, PORTA AIRE CONDICIONAT,TANCAMENT CENTRALITZAT,DIRECCION ASSISTIDA,ELEVALUNAS ELECTRICO,ABS,PORTS AMB LUZ, REGULADOR DE RETROVISORES ELECTRICO,ETC,Etc. EL COTXE FUNCIONA ESTUPENDAMENT NADAMAS CALÇ DONAR-S'UNA VOLTA PER COMPROVARLO, TANT INTERIORMENT COM EXTERIORMENT EL COTXE AQUESTA MOLT BEN CONSERVAT.